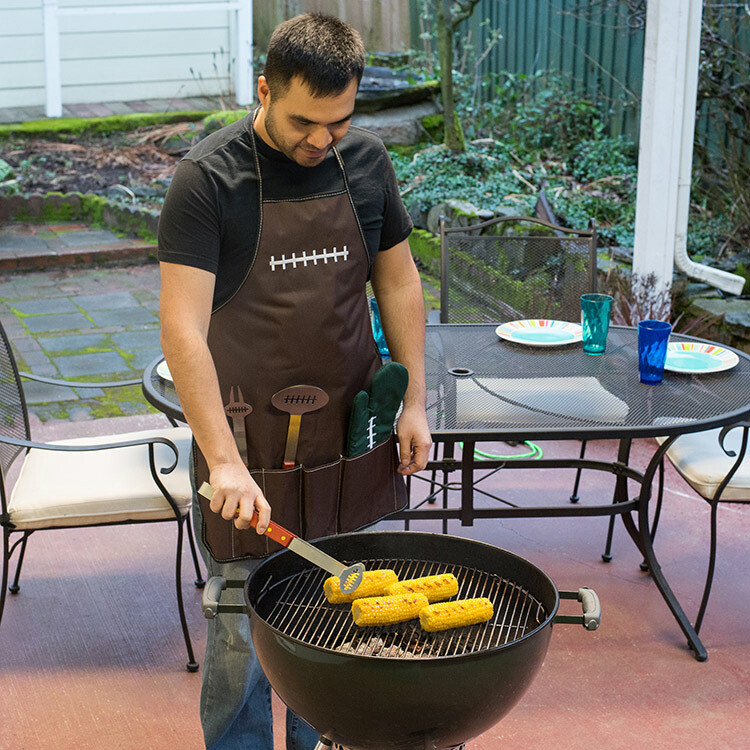 Football Apron- The football apron doesn’t just look good, it keeps the team together while you’re manning the grill. This guy has utility pockets made especially for the tools and mitt to keep them within reach at all times. Bench all the stray barbecuing tools you’ve collected over the years, and let the big boys take the field. You’ll look like a pro when you bring in the Tailgater’s Football BBQ Set, because it includes everything you need to grill one tasty touchdown after another. The unique tools are strong and durable, the mitt will keep you safe from harm and the apron keeps those nasty stains off your favorite Jersey. When you put together a team, it’s important that every man does his part, but works together as one. Piecing together random accessories and tools almost always ends in a grill day fail, because things get lost. That’s what makes the Football BBQ Set the MVP of grilling teams. 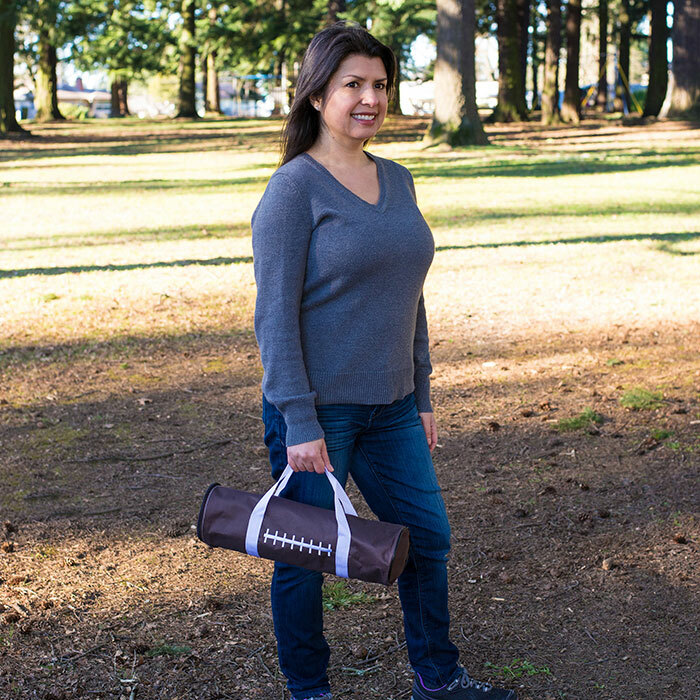 Designed to work together for a solid victory, these accessories are all you need to bring home a win. 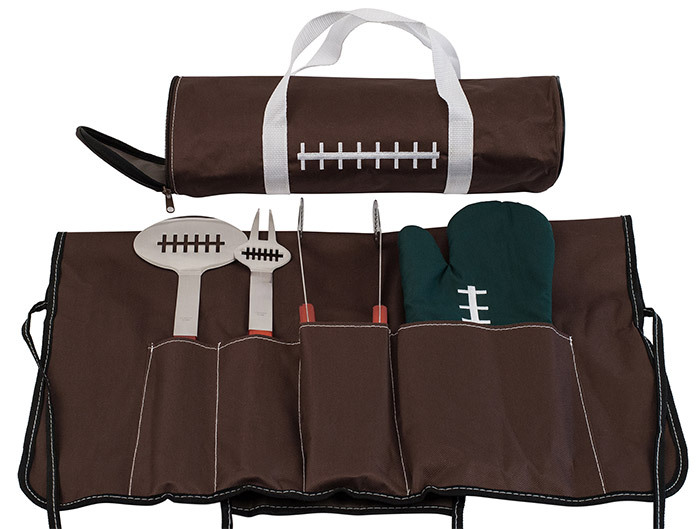 Who Would Love the Tailgater’s Football BBQ Set with Apron and Tote? 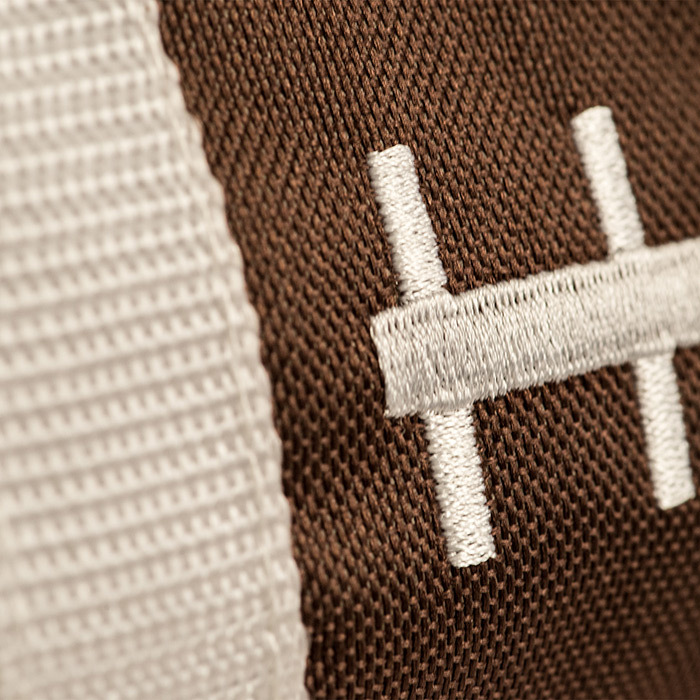 There are two things all men love: grilling and football. By combining the two, you’re creating a universe in perfect harmony. Every die hard who spends his weekends huddled over a grill searing the best steaks on the planet while screaming his favorite teams on to victory will love this. 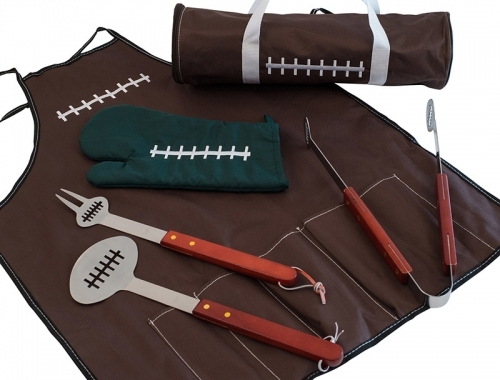 He’ll almost forget where his fantasy football team stands when he’s digging into a perfectly cooked steak or burger, and the Football Barbecue Set will help him get it right every time. Will this actually make me a better griller? 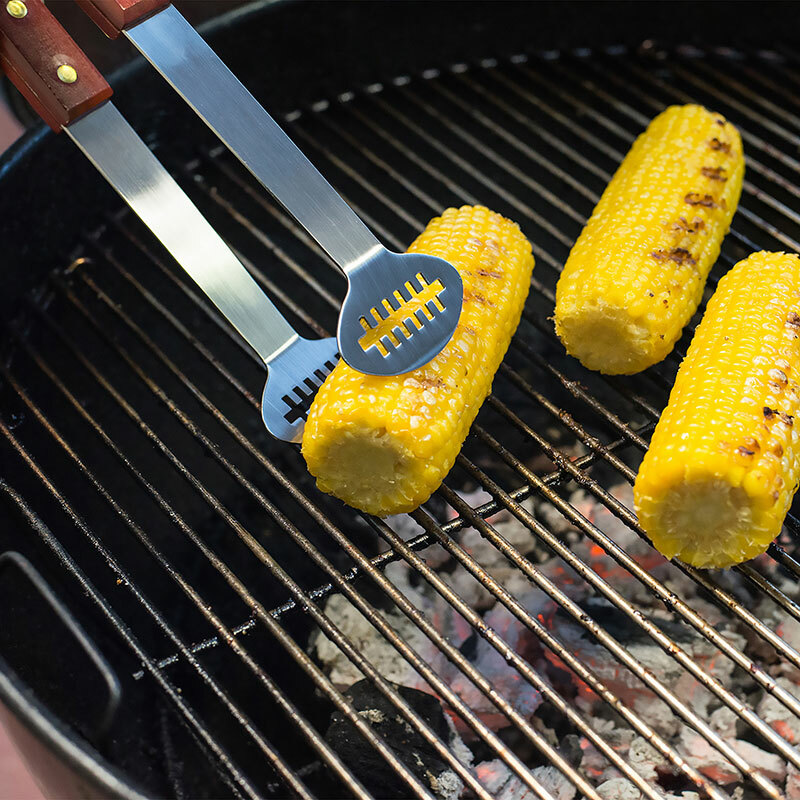 Grilling is all about talent and tools of the trade, so at least you’ll have half of that covered. It doesn’t matter how good a cook you are if the bbq tools you use are bargain basement and boring. 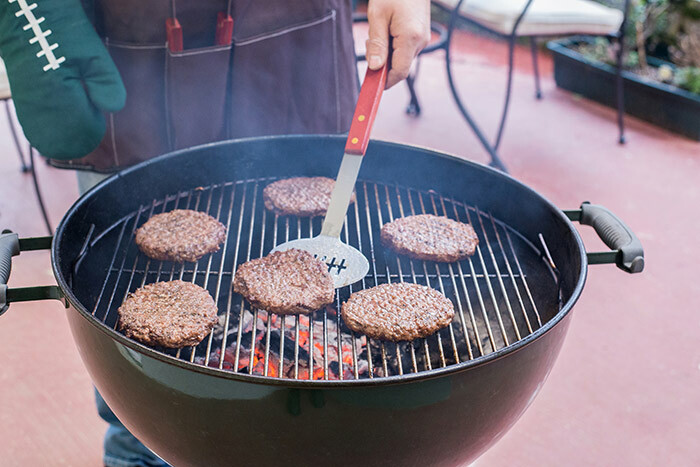 Even if you screw up the food, you’ll still look great at the grill. Will it help my team win? It can’t hurt. While we can’t say that this will actually make the chances of your team’s victory any better, we can say with 100% confidence that it won’t make them any worse. Even if they do lose, you’ll be so caught up in the taste of that amazing burger or steak you most likely won’t care.